Eastern Nazarene is a liberal arts college in Quincy, MA with more than 1,400 students. Power Management Company (PMC) approached Eastern Nazarene in 2013 with the goal of designing a cluster of rooftop solar arrays. Power Management worked closely with both the Vice President of Finance and the Facilities Management team to fully understand the needs and goals of the college in order to develop a customized energy strategy. PMC chose Solect to design and build the solar system for the college. PMC and Solect delivered a turn-key solution including finance, design, construction, operations, and maintenance at a cost that was lower than Eastern Nazarene’s current electricity rate. 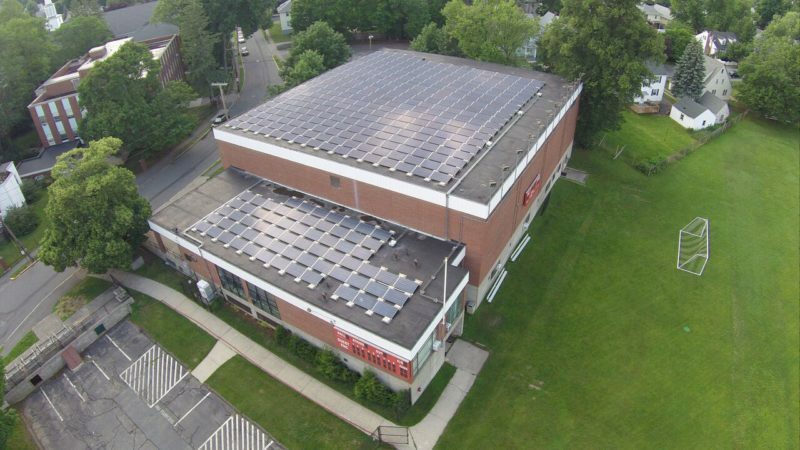 PMC identified the optimal solar developer to design and install the project and negotiated a Purchase Power Agreement with a financier that will own and maintain the system hosted by the college. Since the college has limited open spaces, the optimal placements for their solar arrays were on the rooftops. PMC conducted a comprehensive campus review and identified four rooftops as suitable solar candidates. The completed solar project was designed to save the college an estimated $342,000 over the next 20 years.